The past few weeks the Flanders road agency Agentschap Wegen & verkeer has installed Waze Beacons in various tunnels. These devices emit a signal that allows you to determine your location within a tunnel, where you normally wouldn’t have any GPS satellite reception. Flanders follows several other countries in doing so and as such increases the safety of its tunnels by combating the “tunnel blindness” navigation systems usually experience. 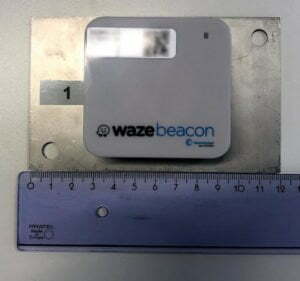 A Waze Beacon, installed on a plate for quick attachment to the tunnel walls. Waze beacons are devices that emit a bluetooth signal in its environment. This signal contains technical data of the state of the beacon as well as a unique identifier. By installing these beacons in a tunnel at 40 meters distance of eachother, it becomes possible for a bluetooth receiver (such as a smartphone) to analyze the signal strength of the several devices and calculate its position in the tunnel. The only data needed alongside the signal is the approximage location of each beacon within the tunnel. This system does not perform a data exchange in two directions. The beacons emit a signal, but are unable to detect whether someone received it. Bluetooth pairing is not necessary to read the data sent by the beacons. As such, these devices can’t be used for calculating the traffic flow by themselves and are unable to track people individually or otherwise. This means there are no privacy concerns in this installation. Waze Mobile Ltd. has partnered with Bluvision to work out this cheap technical solution for calculating your location. It should be stressed though that this is an open system that everybody can use! You only need to receive the bluetooth signals and use the strength of the signals to calculate your position. After the physical installation of the beacons in several tunnels by Agentschap Wegen & Verkeer, Waze and the local Waze community started with the testing of the beacons and the activation of the system whenever no problems were found during the tests. The initial tests of some tunnels took place last weekend and the results have only been positive so far! In the movie below you can see one of the tests we did in the Craeybeckxtunnel in Antwerp. You can notice the location halting for a second or three when entering the tunnel, this due to stray gps signals still seeping in at the entrance. Once these signals die down, the beacons are used for navigation, allowing us to calculate the driving speed just like you could outside a tunnel. At the moment the Craeybeckxtunnel and Kennedytunnel in Antwerp are active in Waze, as well as the Vierarmentunnel in Brussels. After the installation and successful tests, the other tunnels will also become active in the app. Note: the yellow arrow is an indication of the raw gps location. This is of course not present when using the app normally. The Waze Beacons cost around € 8.000 for all tunnels combined. The installation itself increases the cost to about € 30.000. For your information: Waze does not earn any money in this. The beacons are bought directly at the supplier Bluvision, with which Waze has worked out this technical solution. Waze did help with the technical information needed for the installation, but did this without asking any money. After the installation, the local Waze Community helped testing the installed beacons for Waze. Alternative systems that allow devices to calculate their location cost several times as much to eventually achieve the same result. We would like to thank everybody who contributed to the success of this project. In particular we’d like to thank Agentschap Wegen & Verkeer for agreeing to buy and install these beacons. Also Peter van der Veen of the local Waze Community deserves recognition for this as he guided the communication and testing of the system. Thank you all!